The Choir completed its engagements for 2017 singing for guests staying on a New Year’s Break at the Metropole Hotel, Llandrindod Wells. David Power was the compere with Luned Jones and Adrian Morgan conducting two sets. Ann Bufton was the accompanist. Mike Labette played a cameo role entertaining the packed audience to his amusing rendition of “The Auld Axe” in the break between each set of songs. 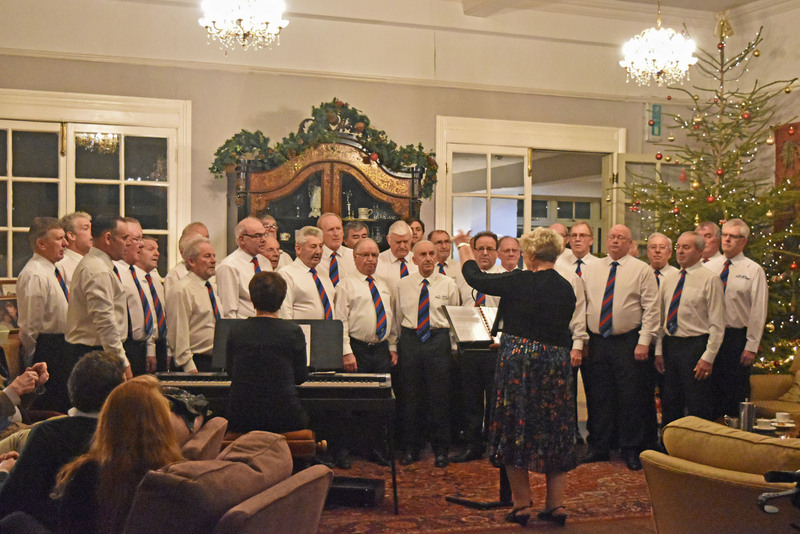 The Choir entertained guests at the Lake Country House Hotel in Llangammarch Wells at Christmas. The concert was compered by David Power and sang a variety of pieces ranging from “Benedictus” to “Calon Lan”. The large number of guests showed their appreciation of an evening’s entertainment which concluded their Festive celebrations. The programme was jointly conducted by Luned Jones and Adrian Morgan with Ann Bufton as accompanist. The excellent acoustics of the Wellingtonia Centre in Llanbadarn Fynydd complemented the voices of our Choir on Saturday (2nd December), to produce one of the most successful concerts of the year. The occasion was the village’s annual fund-raising event in aid of St. Padarn’s Church. During the concert the Builth Choir performed four sets, with numbers varying from “My Lord what a morning” and “Softly as I leave you”, to “The Water is Wide”. The Choir was conducted by Luned Jones and Adrian Morgan, with accompanist Ann Bufton. Also starring were the Llanbadarn Girls, a sextet of local singers, whose repertoire included “Maybe This Time”, and “The Rose”. Additional solos were provided by Gareth Vaughan, whose version of a German drinking song highlighted his spectacular bass voice. The evening was compered by the Rev. Rachael Storer and included a successful fund-raising raffle and splendid finger buffet provided by a team of local supporters. From the superb first moments of the concert – which caused the hairs on the back of your neck stand up – to the final standing ovation, the visit of Côr Glanaethwy was a tremendous success. 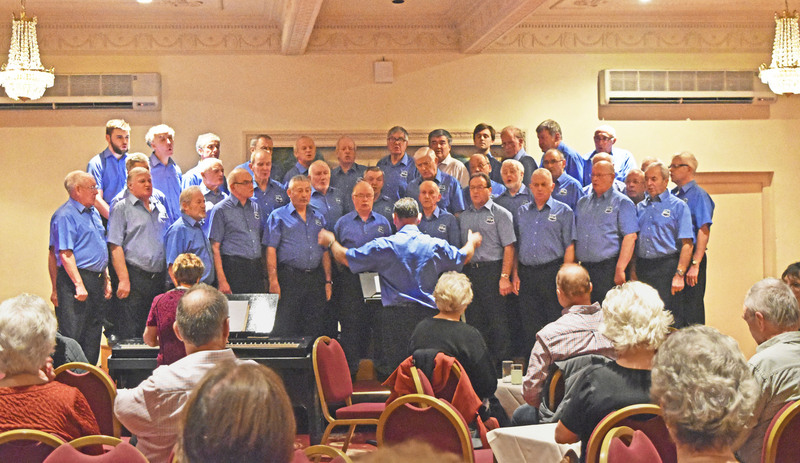 At the invitation of the Builth Male Voice Choir, the Bangor-based visitors entertained a capacity audience at the Pavilion in Llandrindod Wells on Saturday 4th November. They were welcomed by BMVC chairman, Viv Jones, who acknowledged that the effect of the recent fire tragedy in Llangammarch Wells was at the forefront of everyone’s thoughts. He continued with a brief mention of the visitors’ success in “Last Choir Standing” and “Britain’s Got Talent”. Members of the Builth Choir acted as stewards for the evening event. The 60-strong choristers included a very active youth section, and performed a wide variety of numbers both in Welsh and English. They ranged from “Gwawr Wedi Hirnos”, “Cantelina” and “Hwylio Drwy Y Nen” to “Reach” and “The Rhythm of Life” and featured some very talented solo singers, a cappello arrangements and a piano recital by Becca Keen. Their impressive vocal achievements were matched by the extremely well-rehearsed presentation which included backing by organ recordings and accompaniment by Ellen Wyn Keen. Each number was introduced by conductor Cefin Roberts, who paid tribute to local residents who recently campaigned for the re-opening of the Pavilion, and said that members of the Côr Glanaethwy choir would remember this concert for a long time. After a fund-raising raffle Viv Jones described how the visit had emanated from discussions nearly a year ago, when the Builth Choir’s accompanist Ann Bufton heard Côr Glanaethwy sing at the Royal Welsh Showground. She and her husband Colin were the prime movers in persuading the North Wales choir to stage this charitable concert. They were therefore invited to make the presentations of cheques for £1,500 to each of the nominated charities, the Bracken Trust and the Builth Wells Community Support. The Builth Male Voice Choir extended thanks to Roger Watson of Watson Financial for his generous sponsorship, to BSB Sound Limited for fantastic support and to Jase Hawker of the Pavilion for co-operation in staging the event. As a final thank you Viv Jones presented a commemorative plaque to Cefin Roberts. Eleven members of the Choir’s supporters group visited Llangoed Hall in September. They took advantage of a special lunch offer and enjoyed splendid food and service, followed by a stroll in the hotel’s beautiful grounds. 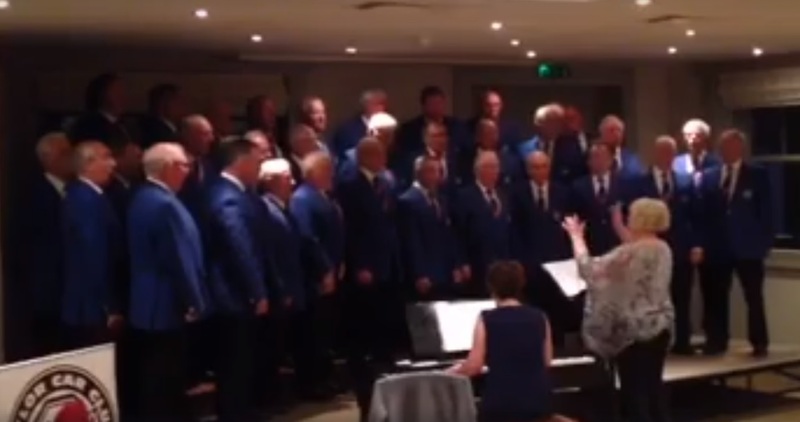 Some people say that there is nothing better than hearing a Welsh male voice choir sing – except perhaps to enjoy SIX choirs singing en masse. 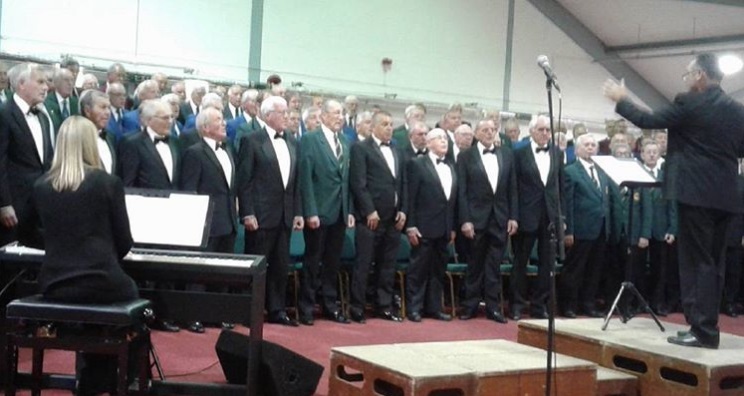 This opportunity took place in Builth Wells last Saturday (16th) when choristers from the Builth Male Voice Choir joined those from Brecon, Dathlu, Cwmtawe, Y Gyrlais, Rhayader and Talgarth in the Clwyd Morgannwg Hall at the Royal Welsh Showground. 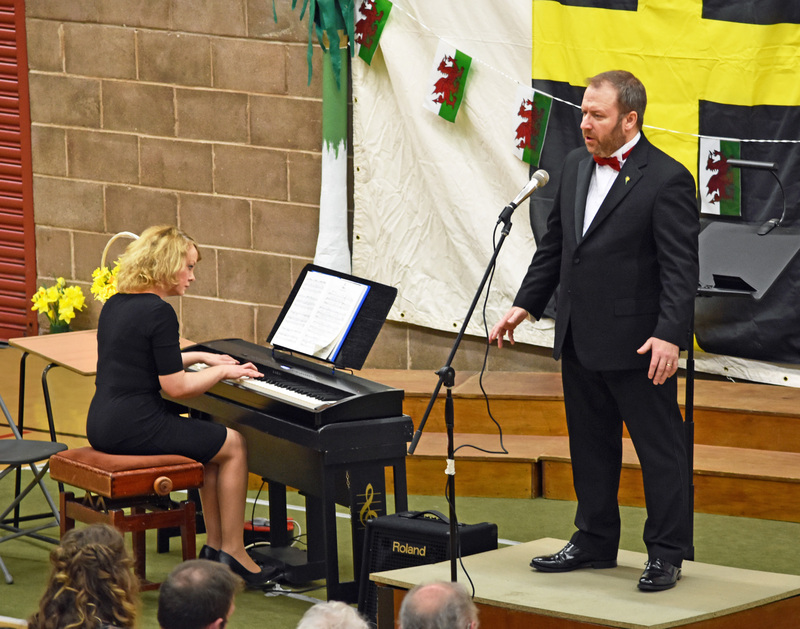 The occasion was to raise funds for the Brecon & Radnor Urdd Eisteddfod 2018 and attracted a capacity audience. The Chairman of the Eisteddfod’s Working Party congratulated organisers who have already raised £40,000 towards the target of £170,000. 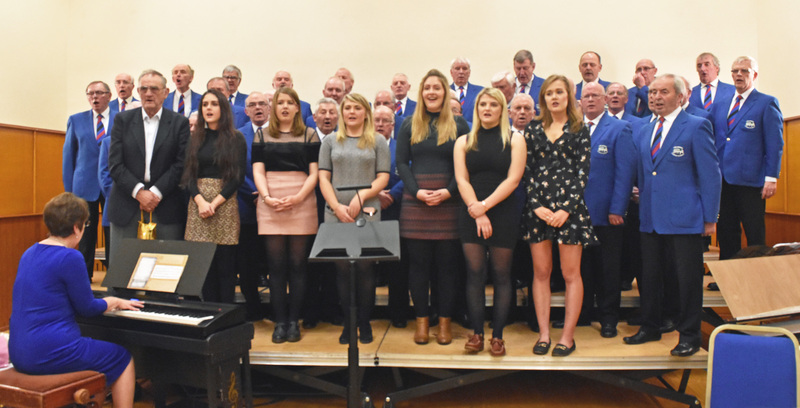 The nearly 200-strong choir was a colourful sight in their varied uniforms, and performed items ranging from “Every morning when I wake” to “Gwahoddiad” and a fast-moving rendition of “When the Saints come marching in”. Bass soloist Iwan Wyn Parry’s impressive voice did justice to both a Handel oratorio and Rodgers & Hammerstein’s “Some Enchanted Evening”, concluding with joining the mass choir for “The Battle Hymn of the Republic”. Helen Jones was the local contralto soloist, performing works in both Italian, Welsh and English, ranging from the Ivor Novello song “My life belongs to you” to joining with the mass choir to sing “O Gymru”. The programme was conducted variously by Lynette Thomas, Adrian Morgan, Jonathon Pearce, Peter Sweeting and Conway Morgan. The excellent accompanists included Becky Drysdale, Bethan Rees and Val Whiston. The audience was entertained in both Welsh and English by compere Deryc Rees who particularly thanked both the sponsors of the event and those contributing to the efficiently-run raffle. He also took the opportunity to publicise other fund-raising events and the forth-coming Urdd Eistedffod Proclamation Ceremony due to take place in Brecon on October 7th. The Choir was once again invited to entertain visitors at Kington Show in 2017. 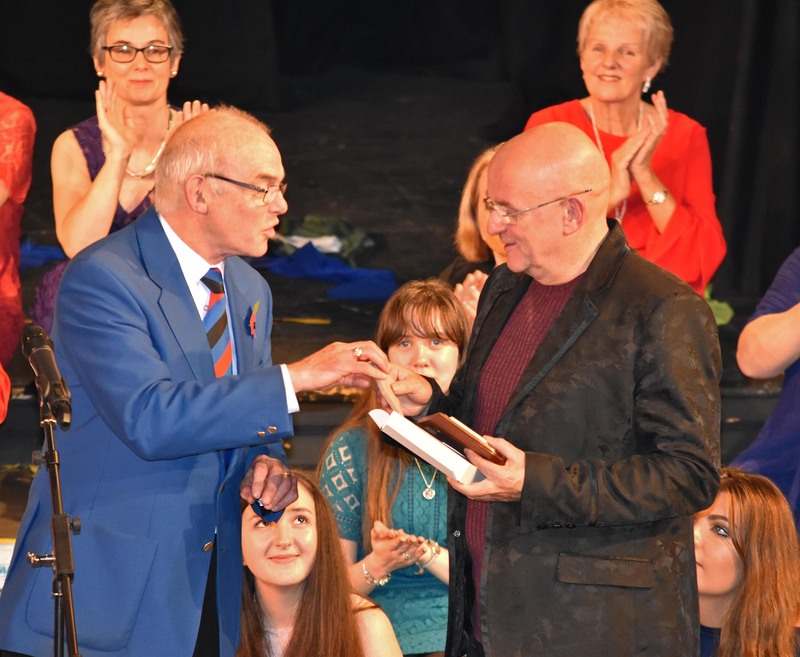 Under the baton of Adrian Morgan and accompanist Ann Bufton the Choir performed two sets of songs – one set in the Flower Marquee and one set in the Members Marquee at the end of the Show. 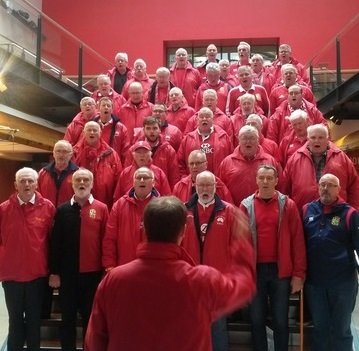 A number of choristers from Builth MVC are in New Zealand singing with the Lions Choir during the British & Irish Lions Tour. Spot them on the photos below? 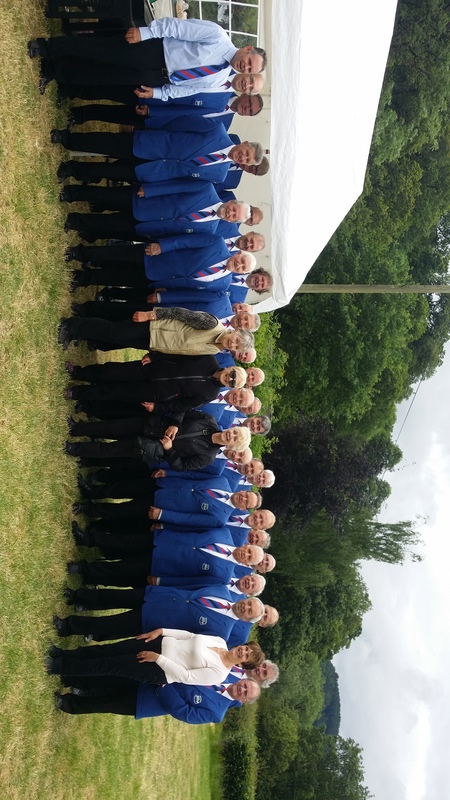 Builth Male Voice Choir travelled to Aberedw on Sunday 25th June for commemoration of a tragic accident close to the village. The occasion marked the death of Flight Lieutenant Ian Hill in 1987 when his Jaguar plane from RAF Lossiemouth was in a training exercise flying up the Wye Valley. In order to avoid a collision he rolled his craft to port, but this hard manoeuvre flew him into the slipstream of one of other planes involved. Sadly he ejected too late, and was killed when the aircraft crashed. To mark the 30th anniversary Aberedw residents had organized children’s sports and refreshments and those attending were entertained by a selection of favourite Welsh choral pieces including “Rachie”. The outdoor concert was conducted and compered by Adrian Jones, with accompanist Ann Bufton. 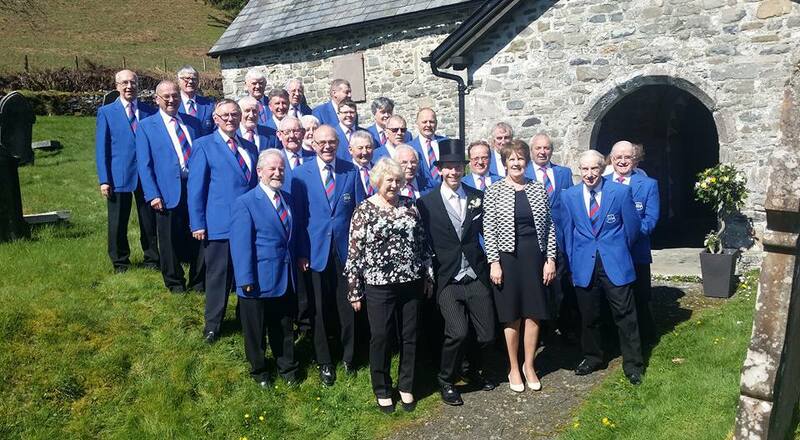 Pictured (centre) with the Choir at the Aberedw commemoration is Mrs Rachel Stewart. The pilot’s widow, Rachel Stewart said how appreciative she was that the anniversary of the sad event had not been forgotten. At her request the event concluded with the singing of the Welsh National Anthem. We were Wessex-bound at the end of May for a late-Spring tour. Our initial concert was in the Benedictine Church of St. Mary & St. Melor, known as Amesbury Abbey. This Grade-2 listed church was originally recorded in the Domesday Book and still features a Norman font, a 13th century Psalter, a 15th century clock and an 18th century organ. The occasion marked a return visit to sing with the Salisbury Plain Military Wives Choir. This group evolved in 2012 from the original Gareth Malone initiative and has already sung before HM The Queen and appeared on the BBC TV’s “One Show”. The ladies choir took advantage of the excellent acoustics to sing a haunting version of “Danny Boy” and the military choirs’ theme “Wherever You Are”, before toe-tapping renditions of “The Rhythm of Life” and “The Boogie Woogie Bugle Boy”. They were conducted by Susan Rayburn, assisted by Hannah Sandu (piano) and Alison Malcolm (organ). Among our favourites were “Bring Him Home”, a Johny Cash trilogy and the stunning “Creation” by Willy Richter. Also featured were members of the Amesbury Abbey Church Choir. They performed the theme music from The Vicar of Dibley – “The Lord’s My Shepherd” by Howard Goodall and a “Gaelic Blessing” by John Rutter. The concert concluded by a standing ovation for all three choirs and a combined grand finale of “Calon Lan” (in Welsh) and “Cwm Rhondda”. Across the road from the Abbey, the Anstrober Arms provided a great venue for what turned out to be one of the most outstanding Afterglows of the year. We were joined by many of the Salisbury Military Wives, together with their conductor Susan Rayburn, who enthusiastically combined harmonies with us singing many old favourites. After a day’s sightseeing in Salisbury it was off to “an evening of Welsh song and Hampshire Brass”. This took place in the 19th century Gothic church of St. Mary’s, which overlooks the town of Andover. The concert was organized by Rotary Andover in aid of the Countess of Brecknock at Hospice and other local charities. 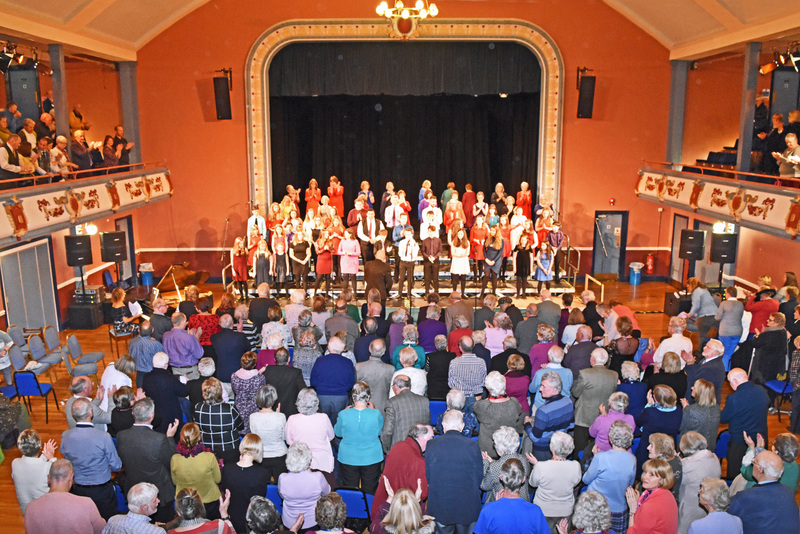 The Andover Town Band was reformed in 2011 under Musical Director Steve Large and once again it marked a return visit by the Builth Choir. The concert was compered by Rotarian John Barlow and featured joint items by the band and choir – including “Light of The World” by Sir Dean Goffin, and “An American Trilogy” arranged by Mickey Newbury – as well as some sparkling brass solos by Andrew Wood, Alison Bonathan, Paul and Will Kennett. It concluded with Bach’s “Toccata in D Minor” – more familiarly performed by an organist. We sang a number of favourites including “With a Voice of Singing” and “Hallelujah”. Both concerts were conducted by Luned Jones and Adrian Morgan, and accompanied by Ann Bufton. Dave Power compered in Amesbury, and also for part of the Andover concert. After the Andover concert a short drive took us to a local hostelry where once again we enjoyed a great Afterglow, including singing requests for local residents, and partaking of a splendid buffet supper. Next day we concluded our trip by enjoying splendid weather for sight-seeing around the city of Bath. Anyone passing the Metropole Hotel last week could be forgiven for thinking that Llandrindod Wells had become a hub of motoring memorabilia. For as well as parking areas reserved for Porsches, and many sightings of bright black and yellow Dutch rally cars, the weekend saw dozens of Naylor Cars celebrating the birthday rally of their Car Club*. 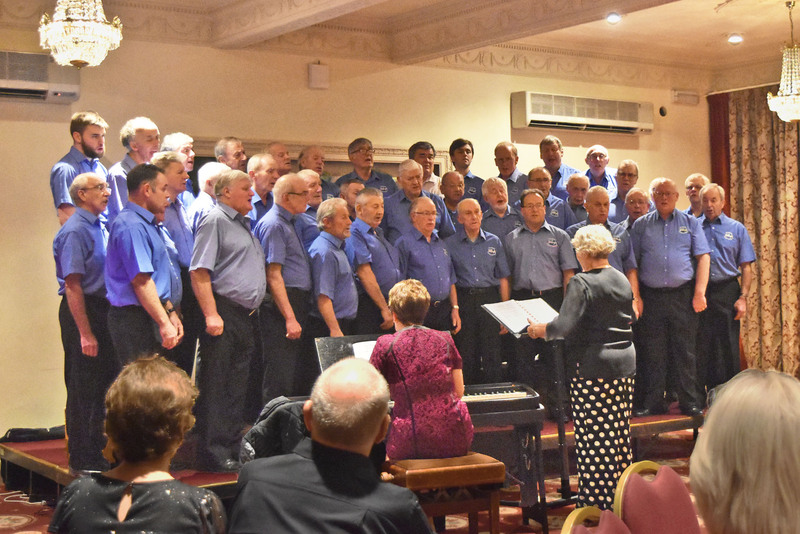 And following a celebratory dinner on Saturday, members were entertained to a special concert by the Builth Male Voice Choir compered by Gwynfor Evans. The musical selection was conducted by Luned Jones and Adrian Morgan and accompanied by Ann Bufton. And the finale featured audience participation with stirring renditions of “Cwm Rhondda” and “Delilah”. 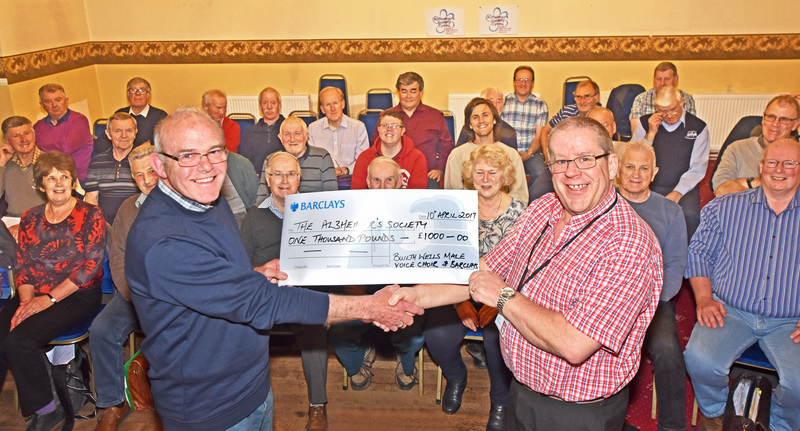 This year Builth Male Voice Choir chose the Alzheimer’s Society Cymru as the charity to support at the annual St David’s Day Concert. A few weeks after Concert the success of the Choir fund-raising was marked at a regular Monday night practice session. Pictured (left) is Chairman Viv Jones, presenting a cheque for £1,000 to David Horne, representing Alzheimer’s Society Cymru. The donation – a result of ticket sales and income from the raffle – at the Choir’s 12th annual St. David Day’s concert was match-funded by Barclays Bank. Glorious day singing for Alex and Chelsea’s wedding at St David’s Church Llanwrtyd Wells. 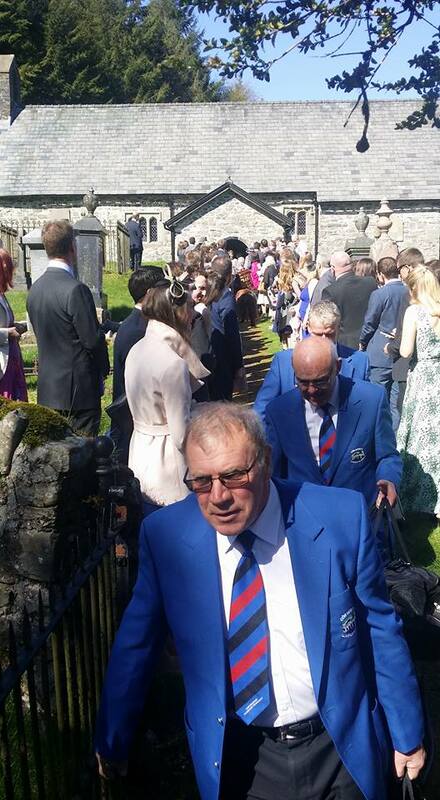 Guests formed a guard of honour for the Choir as they left the Church. An outstanding evening of choral music took place at St. Mary’s Church, Builth Wells on Sunday 19th March. This three choir concert was in aid of Cancer Research & MacMillan Nurses and attracted a capacity audience. The evening was staged by Eleanor Madoc-Davies, the renowned Eisteddfod winner. First to appear were Eleanor’s Girls, six talented youngsters whose glorious tones soared towards the roof of the church. Their repertoire included “Joshua Fought the Battle of Jericho”, “the Rhythm of Life” and “Ave Maria”. Later in the concert a selection of solo items demonstrated the full range of these young voices. Builth Male Voice Choir’s selection ranged from “Benedictus” to “Let It Be Me” and “When I Survey the Wond’rous Cross”. Builth Wells Ladies Choir sang “The Lord Is My Shepherd” and “With the Voice of Singing”, but amazed the audience with their clever rendition of “Sing a Song of Sixpence”. They then went on to stun everyone with a powerful version of the “Hallelujah Chorus”. Eleanor Madoc-Davies’ swansong was a performance of “The Holy City”, accompanied by her young protegees – which resulted in a standing ovation from the audience. She was presented with a bouquet to mark her birthday. In thanking everyone involved (including all the conductors and accompanists) Eleanor announced that in the region of £800 had been raised for the charities. In conclusion all the singers combined in a powerful offering of “Calon Lân”. 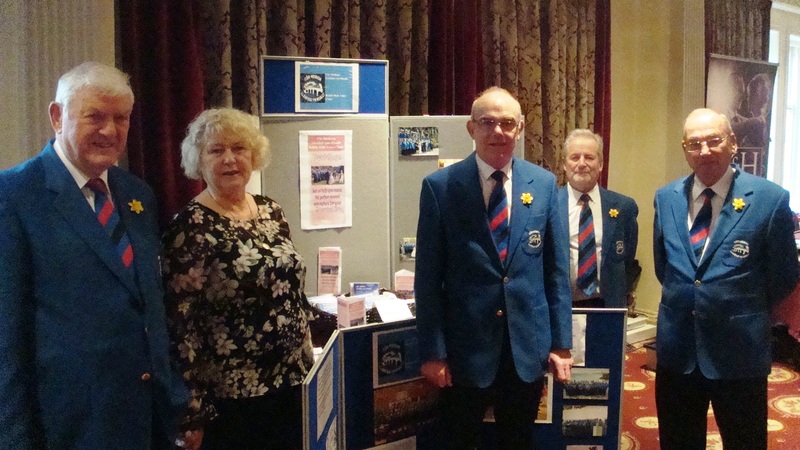 Choir members promoted Builth Male Voice Choir at the Spring Wedding Fayre at the Metropole Hotel, Llandrindod Wells on Sunday 5 March. A number of prospective bride and grooms made enquiries at the stand taking away Information leaflets and expressing a wish to invite the Choir to be part of their wedding plans. The traditional St. David’s Day Concert was staged by the Builth Male Voice Choir on 4th March. This event marked the 12th such occasion and the audience enjoyed a varied programme of music from their talented guests. The compere was Gwnfor Evans. 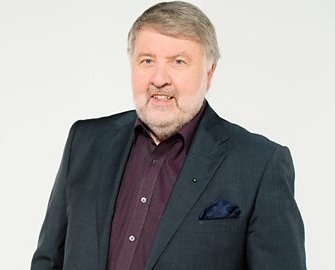 Featured was baritone soloist Gwynedd Parry (winner of the Osborne Roberts memorial Prize at the 1998 National Eisteddfod) whose repertoire included Bryniau Aur Fy Ngwlad and the Anthem from the musical Chess. He was accompanied by his wife pianist Meinir Jones Parry (also a National Eisteddford winner). 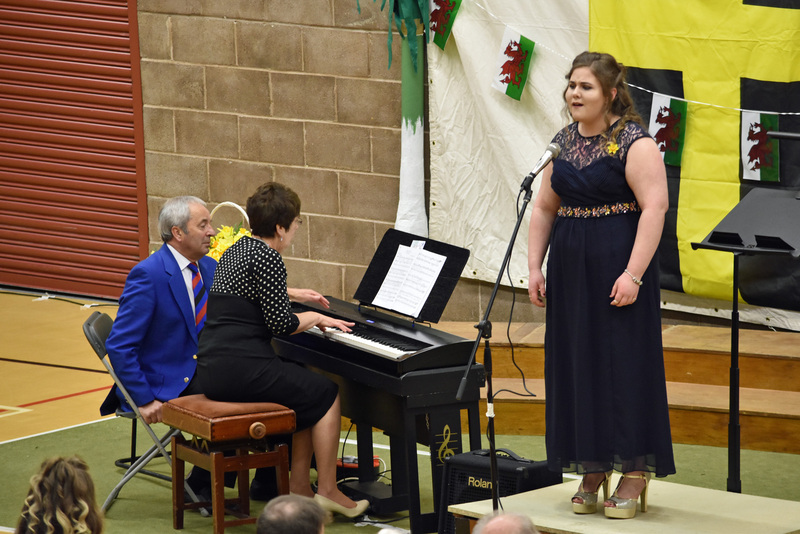 Also performing was local mezzo soprano Morgan-Ellen Field who is hoping to further her studies at the Royal College of Music and Drama in Cardiff, and then pursue a music career. Included in her programme was “My Little Welsh Home”, and Mozart’s “Voi Che Sapete”. The Choir’s performance included a wide range of music ranging from “Anfonaf Angel”, via Verdi’s “Speed Your Journey”, to “Bring Him Home” (from Les Miserables). 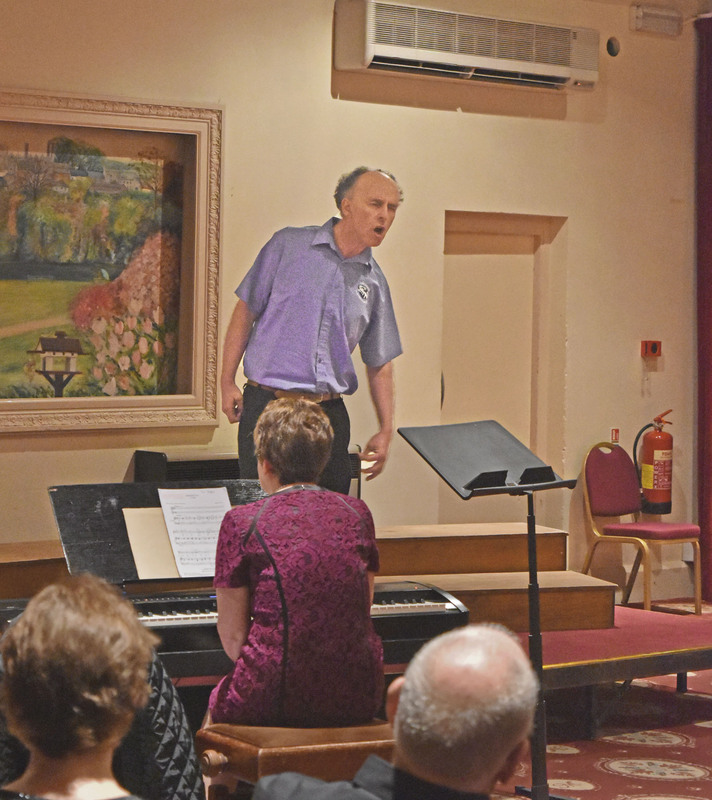 The concert was conducted by Luned Jones and Adrian Morgan with accompanist Ann Bufton. The evening included a well-supported raffle and the Choir would like to express its appreciation to those who donated prizes including the Llanelwedd Arms Hotel, The Old Railway Garden Centre, Arwyn Morgans – Butchers, The Greyhound Hotel, the RWAS, Morrisons (Brecon), and the Choir supporters group. The amount of £412.20 was raised by the raffle for the Alzheimer’s Society Cymru. This donation is to be matched by Barclays, whose representative, Howard Nixon, also attended the concert to on behalf of the Bank.